A great way to spend an afternoon, parks have always been an important addition to human life. Over the years, parks have become more elegant and aesthetically pleasing, however, the core concept has remained unchanged. Any park across the world offers lush greenery, vibrant flowers, and enough space for picnics and physical activities. Parks in Dubai are no different, even though they may not be accessible all year long. During the colder months, make sure you take a deep breathe and enjoy nature at the best parks in Dubai. If you want to visit the best parks in Dubai, then you definitely need to visit Safa Park. 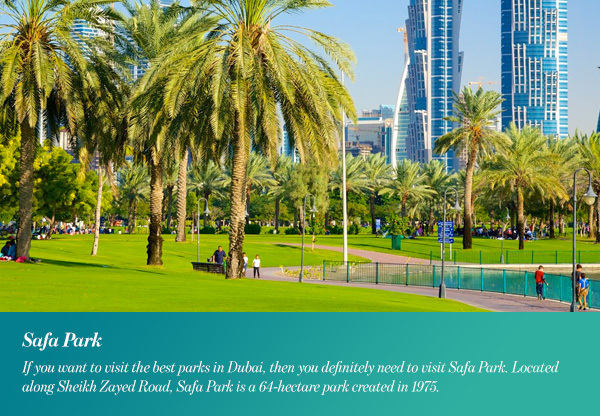 Located along Sheikh Zayed Road, Safa Park is a 64-hectare park created in 1975. With three lakes, over 200 species of birds, and 16,924 different trees and bushes, it is the perfect place to pass a lazy afternoon. It also boasts an indoor playground, a little forest, and a hill. At Safa Park, you will also find a waterfall flowing out of the hill and into the largest lake which holds a fountain and touring boats. Permanent barbecues are set up around the edge of Safa Park, which is Dubai’s largest park. Moreover, the park lies within proximity to Burj Khalifa, Emirates Towers, and the Dubai World Trade Center. 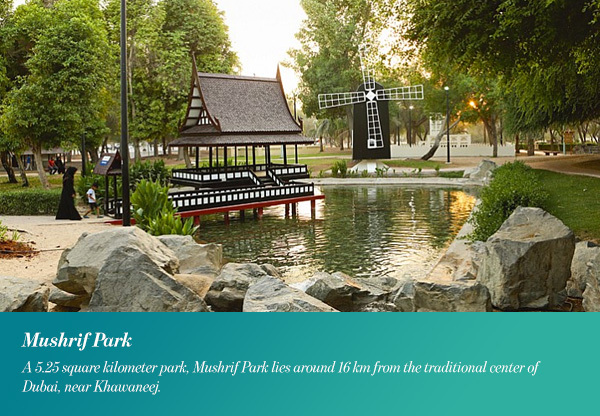 A 5.25 square kilometer park, Mushrif Park lies around 16 km from the traditional center of Dubai, near Khawaneej. While it was originally created in 1980 by Dubai Municipality, Mushrif Park was expanded and renovated in 1989. The park now features a swimming pool and an area with traditional houses from around the world. It also includes covered areas, an equestrian center, camel riding, barbecue areas, and playgrounds. If you are looking for a park with outdoor exercise facilities, make sure you visit Mushrif Park’s cycle track, volleyball, basketball and handball courts. 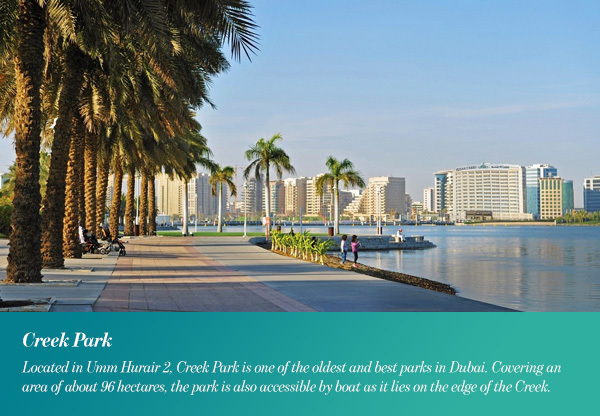 Located in Umm Hurair 2, Creek Park is one of the oldest and best parks in Dubai. Covering an area of about 96 hectares, the park is also accessible by boat as it lies on the edge of the Creek. In addition to walking around amidst greenery, you can rent bikes, ride a small train, or simply enjoy a picnic or barbeque. Furthermore, Creek Park is home to Dubai Dolphinarium and Children’s City. Designed for kids between two and 15 years old, Children’s City is a cluster of buildings in the middle of the park. It offers learning experiences through a planetarium, theatre, and plenty of workshops. Moreover, the park boasts a cable car which runs for around 2km along the length of the park at a height of 30m. Located in the Zabeel district, Zabeel Park sits between Al Karama and the Dubai World Trade Center. Open to the public since 2005, the park is divided into several sectors connected by pedestrian bridges. Spanning across an area of 47.5 hectares, the park has a lot to offer visitors. It is a popular destination for sports and live music. Moreover, it includes a 4.3 km jogging track, pedestrian tracks, BMX track, skateboarding park, barbecue and picnic areas. As well as a boating lake, ice skating, a mini cricket pitch, golfing area, and lakeside restaurants. Zabeel Park also features children’s play areas. That’s not all though, as the park is home to an exhibition gallery and a fitness center. With an obvious technology-based theme, Zabeel Park encourages visitors to engage in educational and interactive displays at the Alternative Energy Zone, Communications Zone, and the Techno Zone. There is also a 3D cinema and Wi-Fi for visitors. If technology doesn’t interest you, you can stroll by over 3,000 palm tree plantations and 7,000 other trees of a variety of 14 species. 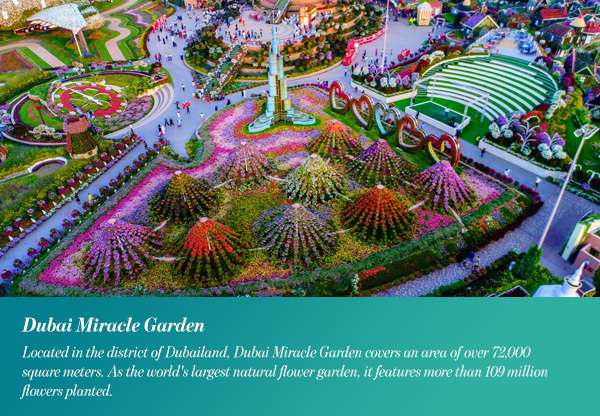 Located in the district of Dubailand, Dubai Miracle Garden covers an area of over 72,000 square meters. As the world’s largest natural flower garden, it features more than 109 million flowers planted. Launched in 2013, the park was developed at an estimated cost of Dh40 million ($11 million). It features a total garden area of 2 million square feet, retail stores, peacocks, and a floral clock. This park in Dubai also welcomed the Dubai Butterfly Garden in 2015. As the world’s largest and the region’s first indoor butterfly garden and sanctuary, it is home to over 15,000 butterflies from 26 species. 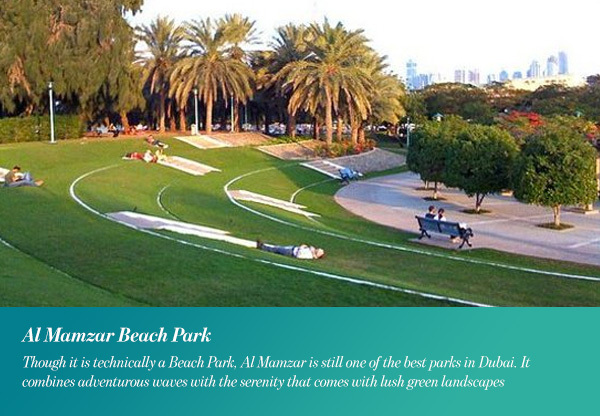 Though it is technically a Beach Park, Al Mamzar is still one of the best parks in Dubai. It combines adventurous waves with the serenity that comes with lush green landscapes. At Al Mamzar Beach Park, you can indulge in beach facilities, swimming pools, and even rent a cabin for a day. The park also includes a skateboard platform, children’s game areas, and bicycle rentals. Since the park is on the beach, you can also visit the basketball, football, and volleyball fields by the shore. The park also offers restaurants and cafeterias, as well as beautiful plants and green spaces. Located in Downtown Dubai, Burj Park is an island in Burj Lake. Designed for corporate events and exhibitions, the park is within walking distance to The Dubai Mall and of course, Burj Khalifa. You can rent a bike at the park entrance and visit the Old Town and the area surrounding the Burj Khalifa. While there isn’t much to do at Burj Park, tourists generally visit to experience a view of the magnificent Burj Khalifa. You can reach the park from Mohammed Bin Rashid Boulevard or walk across bridges from the mainland. If you want to visit parks in Dubai at any time of day, then you definitely need to visit Al Ittihad Park. Open 24 hours a day, the park is ready to welcome visitors at any time. Covering an area of 1.1 million square feet, Al Ittihad Park is located on Palm Jumeirah. The sustainable green oasis is home to over 60 varieties of trees and plants indigenous to the UAE. Opened in 2012, the park features a 3.2 km jogging track, gym equipment, and two children’s playgrounds. Although the park is not known for its greenery, it is the perfect place for a scenic early morning jog. 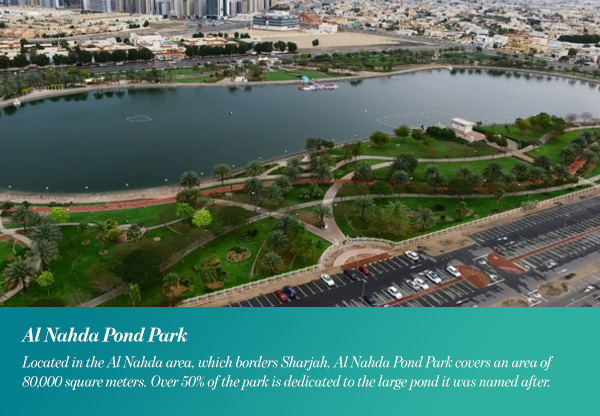 Located in the Al Nahda area, which borders Sharjah, Al Nahda Pond Park covers an area of 80,000 square meters. Over 50% of the park is dedicated to the large pond it was named after. This park boasts a jogging and cycling track, exercise equipment, gazebos for picnics, and children’s play areas. As well as sports facilities for tennis, volleyball, basketball, and football. Al Nahda Pond Park also offers visitors boat rides, bike hire, a mini ride, and bouncy castles.